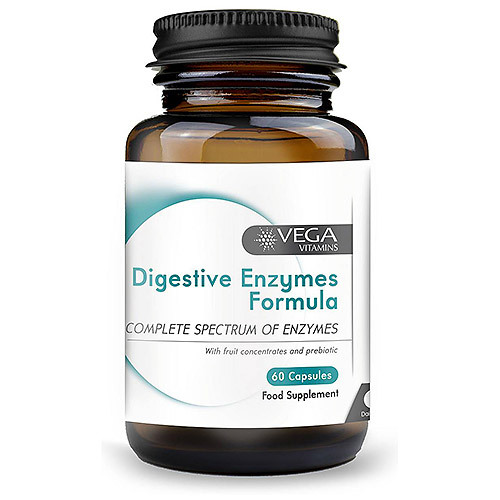 Vega Vitamins Digestive Enzymes Formula provides a combination of enzymes that may help in the breakdown of foods; such as fats, proteins, starches and fibre, as well as unlocking vital nutrients that are absorbed into the bloodstream. Various factors can affect the body`s capacity to manufacture these enzymes, which may lead to poor digestion and malabsorption of nutrients. Various foods can provide a source of enzymes but must be consumed raw, as heat can eliminate their nutrients. Vega Base (Acacia Gum, Fruit Juice Concentrates [Aronia, Aplle, Elderberry, Blueberry & Blackcurrant]), Potato Maltodextrin, Vegetarian Capsule Shell (Hydroxypropyl Methylcellulose, Colours (Titanium Dioxide, Copper Chlorophyllin), Betaine, Bromelain. Papain, Protease, Anti-caking Agent (Magnesium Stearate), Lipase (Soy), Cellulase, Amylase. As a food supplement for adults, take 1-2 capsules daily with food or as directed by a healthcare professional. This product should not be used as a substitute for a varied diet. 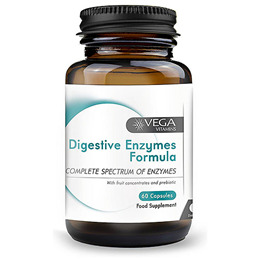 Below are reviews of Vega Vitamins Digestive Enzymes Formula - 60 Capsules by bodykind customers. If you have tried this product we'd love to hear what you think so please leave a review.